DISGUSTING! A Girl Stopped Using Deodorant and the Results Are Extremely Eye-Popping! When I asked a friend which is important for him in choosing a girl, the face or the smell, he firmly said that he would rather choose a not so pretty girl but smells like heaven. And I am sure, all of us would agree. It is a complete turn off if your date stinks. It's like you are in a trap that you want to get out immediately, but the shackles are too tight. Hygiene is very basic anyway. It is one of the simplest lessons in life that means like the whole world. A girl named Meg Zulch challenged herself and her personal hygiene. 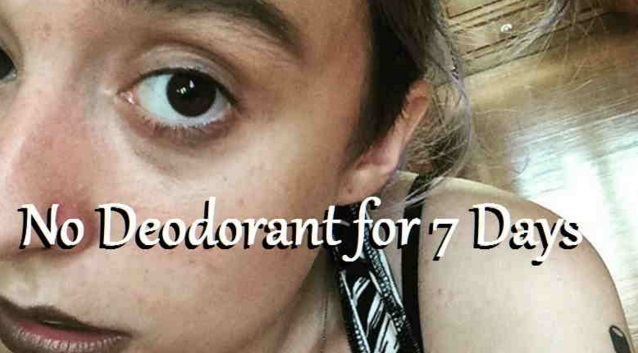 She tried to stop using deodorant for a week. Yes, you read it right, hello B.O, for seven days! Disgusting as may seem, but check out the extremely surprising results below. 1st day: She was over-thinking about her smell up to the point that she apologized to everyone, even though no one could smell her stinky odor. 2nd day: This day was a bomb! Her strong foul smell is all over. Instead of feeling insecure, she tried to act normal. Ironically, she felt a bit fresher because her armpit pores are not clogged anymore. 3rd day: Her aroma is an atomic bomb for those who have noses, but surprisingly, she really didn't mind. She just brushed it off thinking that a smell should not affect a person's outlook on life. 4th day: Zulch was shocked when the odor is not so powerful as it was yesterday. Maybe because her olfactory nerves become used to it. She tried to walk around the city and her under arms did not sweat too much. 5th day: She realized that her smell is still a bomb for other people who are not used to it, when her mom told her about it. They were in a car when her mother smelled the very awful odor and she gave her daughter some strong pieces of advice. 6th day: She started to be worried again because of her mom's disagreement and she almost resumed her practice of using Deo. Good thing that her mom told her an alternative. She started to use essential oils. The one that blended natural body chemistry is the oil which smelled like an ocean. 7th day: After 24 hours, her armpits still smelled like the essential oil. From then on, she never used deodorant anymore and still she smells like an angel.